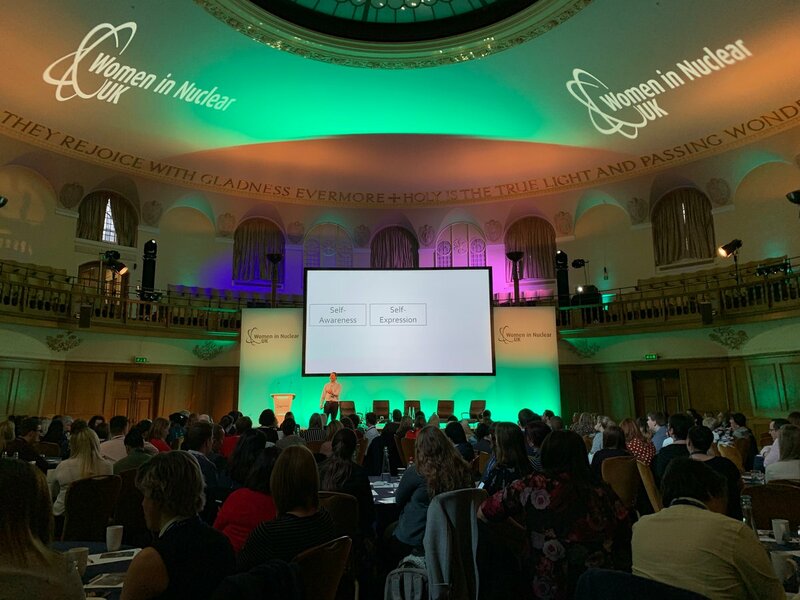 Another sell out event for Women in Nuclear UK! Some 250 people attended their Annual Conference 2019 on 30 January, held at the Church House Conference Centre in Westminster. President of WiN UK, Jack Gritt, took to the stage, welcoming all and giving a powerful demonstration of inclusion by asking everyone stand. She then asked three questions, asking people to stay standing if they had; ever felt excluded, felt sad, angry or frustrated by the exclusion, suffered poor performance or difficult relationships because of the exclusion. At the end of the questions all 250 people in the room remained on their feet. The atmosphere in the room was powerful, the awareness that this number of professional people had all, at some point in their lives, experienced this negative behaviour was compelling. It emphasised the need for change and for everyone to be consciously inclusive. Alexander Pett from River Leadership Consultancy provided another stellar presentation on “Dualisms” and the 5 core drivers of perception and personality. The theories provided great insight into how our behaviours impact inclusion and exclusion and there was certainly some very lively debate in the room! Fiona Jackson, Vice President of WiN UK, Claire Gallery-Strong, WiN Cumbria, and Nikos Adamidis, NDA treated us to some insights into what it means to be part of WiN UK, how WiN UK is pushing for greater gender equality in 2019, helping to establish frameworks for companies and organisations to identify inequality, as well as build strategies to address this and bring about ways to measure performance. They did a great job as WiN UK received many offers of support on the day from willing volunteers. 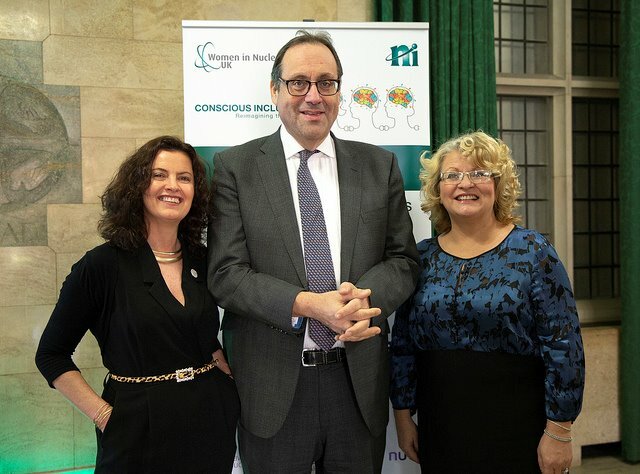 WiN UK were honoured to have Richard Harrington MP as a keynote speaker and he highlighted the importance for diversity and inclusion and emphasised the Government’s support for nuclear energy. He threw away his script and spoke to the audience with knowledge and authenticity, which was clearly appreciated by the audience. Alex Pett then lead a group discussion with Anne Jenkins, Head of Equality, Diversity & Inclusion for the Nuclear Decommissioning Authority, Gwen Parry-Jones OBE, Executive Director, Operational Development, Horizon Nuclear Power, Jillian Chung, Head of Construction Legal, EDF Energy, and Steve Randle, Partner, PwC. In the session the panel shared their experiences of inclusion/exclusion which provided the audience with some great tips, in particular reminding people to “call it out” when they observed exclusive behaviour. The session also asked attendees to return to their organisations and remind them of the WiN Industry Charter they signed up for, encouraging all to have small conversations and to connect with others to generate greater inclusivity. The highlight of the day was the awards ceremony and the recognition for the hard work and achievements by members over the year. The afternoon was made up of five workshops, kindly hosted and delivered by Emily Hutchinson (EJH Consulting) and Caroline Brown (Atkins), Sarah Cave (Primeast), Alexander Pett (River Leadership Consulting), Sarah Montgomery and Nicola Boyle (Delve OD) and Deena De Vries Jones (HCD UK). These fabulous and professional individuals gave their time freely and delivered some knock out content! As the day drew to a close Adrienne Kelbie, CE of ONR, finished with an inspirational reminder that consciousness is a choice to see, think, act differently and be inclusive: choosing to be a WiNner. Jack Gritt took to the stage for the final time, thanking all those who had provided sponsorship and support, and announcing WiN UK’s Industry Partnership 2019 with Jacobs. She expressed her thanks to Jacobs for this opportunity highlighting their long term support of WiN UK and their unwavering commitment to inclusion and diversity.